If you sail a boat of just about any kind, you know it’s a good idea to have a good sailing bag to keep all your belongings together. Whether you are heading to the changerooms, up in the club after a hard day’s sailing. or stowing your sailing gear below deck when out on the water, your valuables such as your watch, wallet, smartphone, spare clothing and maybe even your laptop all need to be protected. Not only do you want to keep them secure, but you will also want to keep your gear dry. 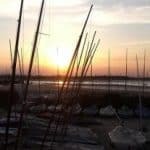 These days there are some excellent sailing bags to help out. 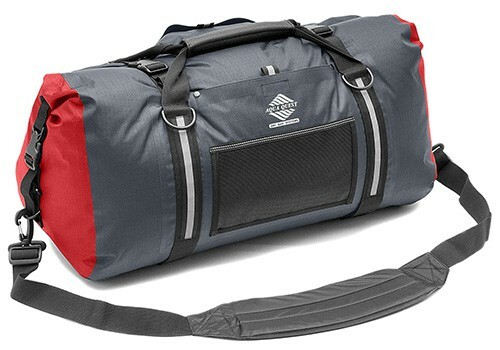 They include duffel bags, dry bags, backpacks, pouches, and accessory bags. In this article we will explain each of these categories and review our top picks of each type of bag. 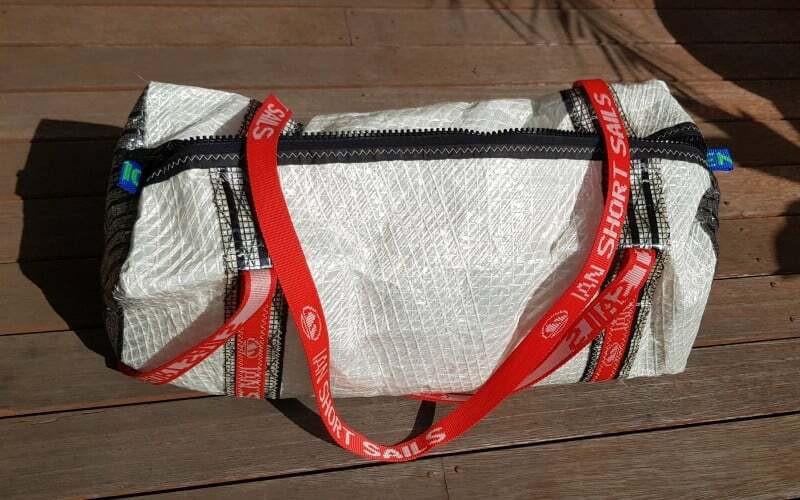 My personal sailing kit bag is a sailcloth duffel bag. 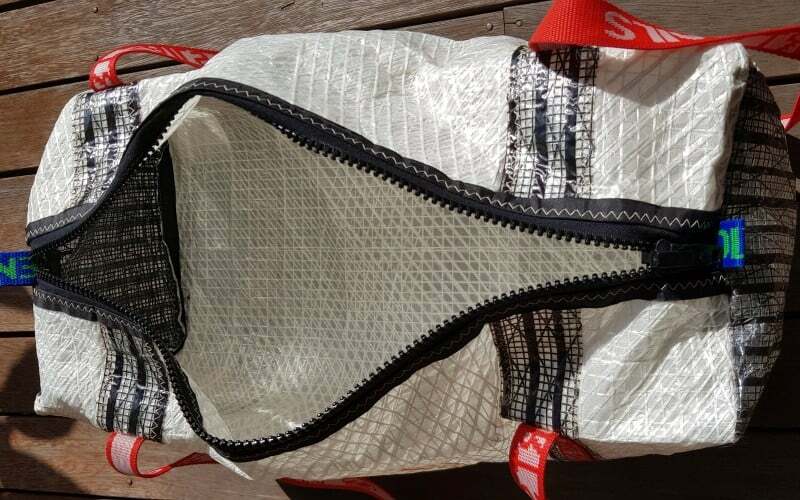 I bought a sailing jacket and pants years ago from a local sailmaker, and he shipped it to me in a bag made from old sails – well it wasn’t actually “old” sailcloth, I assume it was offcuts of new sailcloth from sails that he just made or repaired. I thought “What a great idea”! Rather than throwing offcuts of the sailcloth into the trash, he stitched up these bags made from sails and offered them to local sailors. It’s a win for him, in that it cuts down on waste he has to get rid of, and it’s free advertising for him (he puts his logos on the bags and straps). After a day’s sailing, quite often you don’t take your sails back up into the club, but you almost always take your bag with you, so it’s advertising for him wherever you go. They probably don’t take too long to make – they’re stitching 100’s of yards of sails every day, so a bag would be pretty quick and easy. He might have even got his apprentice to do it. The bags are made out of sailcloth, so they are super strong. It also has long straps which makes it easy to carry. Mine has a real sturdy zipper and heavy-duty stitching as well, and the whole bag just feels like it will last a long time. 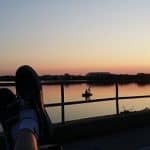 A few downsides – it’s not a waterproof sailing bag, and it doesn’t have any compartments, but for me it’s not a massive deal. Having these features would be good sometimes though. When I go sailing on yachts, I’m a bit paranoid about water getting into my car remote, phone and wallet. Bags often end up all over the place when sailing in yachts – there’s often water in the bottom of the boat and you can get it coming in from rain, waves or sail changes, so I just slip all of these important water-sensitive items into a zip-lock freezer bag and so far, it’s worked fine for me. 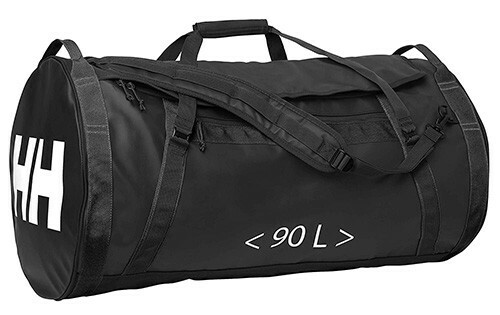 Sailing Duffel Bags are similar in design as your standard gym bag. Typically they are waterproof, lightweight and durable. 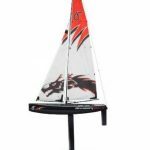 They are usually made from polyester, have carry straps, pockets and are soft-sided for easy storage and to protect your sailing gear. This Helly Hansen Duffel Bag has a sporty and contemporary look. 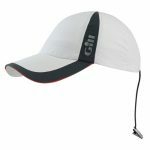 It is made from 100% polyester fabric which makes it durable and lightweight. This sailing bag is also waterproof and has top carry straps with removable padded shoulder straps. The straps make this bag easily convert to a backpack if desired. There are two pockets, one on the outside with a zipper plus another on the inside. It also comes with its own external wash bag. In addition to providing all the functionality of a regular sailor duffel bag, this Aqua Quest product offers protection from the elements for your valuables. 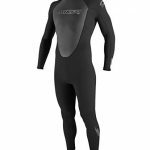 It is lightweight and durable and does a good job of keeping water, snow, dirt, dust and sand out. There is a comfortable padded grip handle as well as a removable/adjustable shoulder strap. 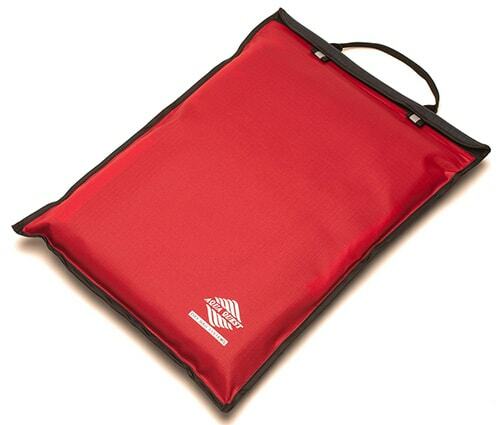 Two external mesh pockets and four webbed loops ensure you can store and haul your belongings and keep them dry. The manufacturer of this product has added a two-year ‘no worries’ warranty. Waterproof Sailing Dry Bags are designed for the elements. Made from durable materials such as tarpaulin, these bags are lightweight and have a tall, cylindrical shape with extra strong seams and a carry strap. They will hold a lot of things you want to keep safe. 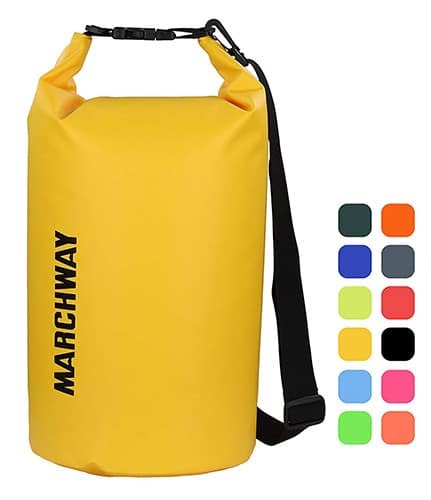 Lightweight, compact and durable are all words that best describe the MARCHWAY Floating sailing dry bag. It is made from rip-stop tarpaulin fabric and features a sturdy welded seam. Even under extreme conditions, this bag will survive the trip and keep your valuables protected from the elements. With a secure, watertight seal, whatever you load into it will remain dry at all times. It is easy to use and clean and will float on water if it ends up overboard. 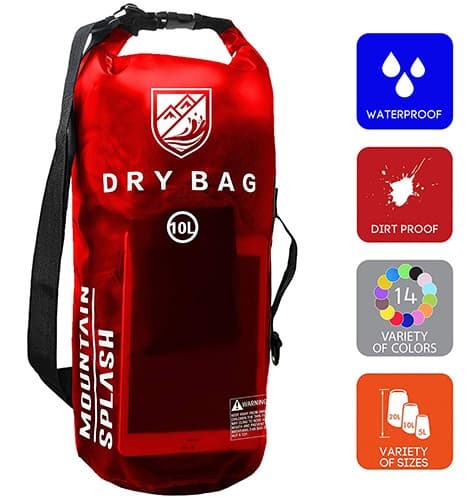 The Mountain Splash Waterproof Dry Bag is another product that will float on water should you accidently knock it overboard. It is lightweight, durable and waterproof. It has a comfortable shoulder strap. The seams are extra strong so you can pack it full of valuables like your phone, camera and more! Sailing Backpacks are much like a standard backpack but with some really great extra features. In addition to being waterproof and made of durable material, such as vinyl tarpaulin, they look great. Designed to be both functional and attractive, these backpacks are equipped with pockets, straps and come in large sizes so you can stow away a lot of different things ranging from clothing to valuables. Plus, there are pockets to help keep you organized. It’s a backpack with a difference. 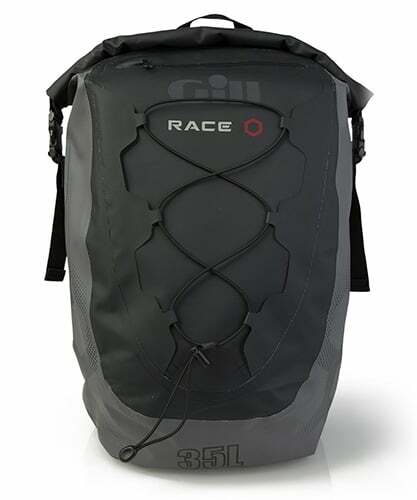 This Gill sailing bag is huge. It will hold up to 35-litres of stuff in a waterproof, durable PVC tarpaulin constructed space. 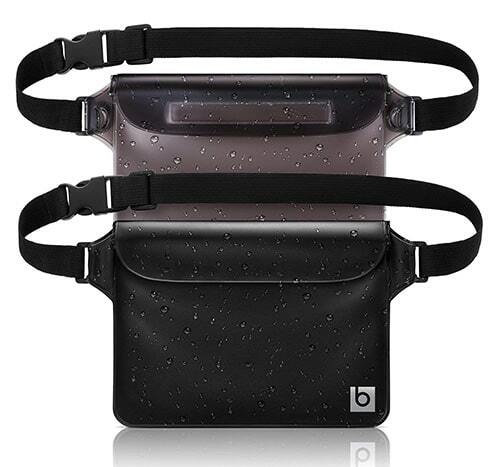 There are a number of different compartments including a large pocket in the front. It is padded for comfort and is highlighted by a stylish design that will keep clothes and extras dry and easy to access when needed. The seams are welded, not stitched which makes them stronger and longer lasting. It’s lightweight and a waterproof sailing backpack that floats. 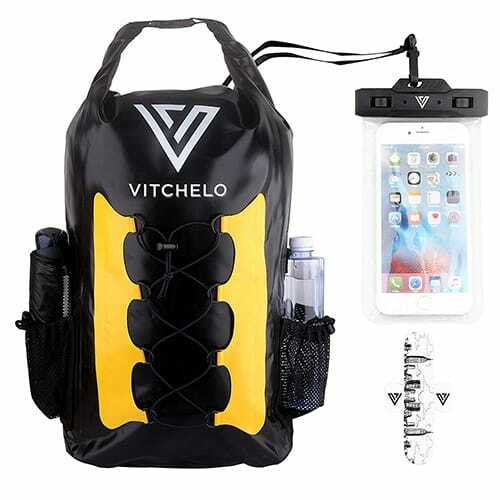 The Vitchelo Dry Bag Backpack will keep your essentials dry and easy to find. Made from vinyl tarpaulin, the seams are welded and there is a solid roll-top closure that provides a watertight seal. 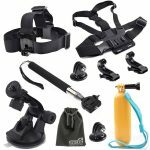 Other great features include a reinforced one-handed strap, chest and waist straps and a breathable shoulder strap. There is elasticized webbing and mesh netted pockets for additional storage. With contemporary styling, this bag fits in with any type of extreme adventure you can throw at it. Not every day out on the water calls for a large storage solution. 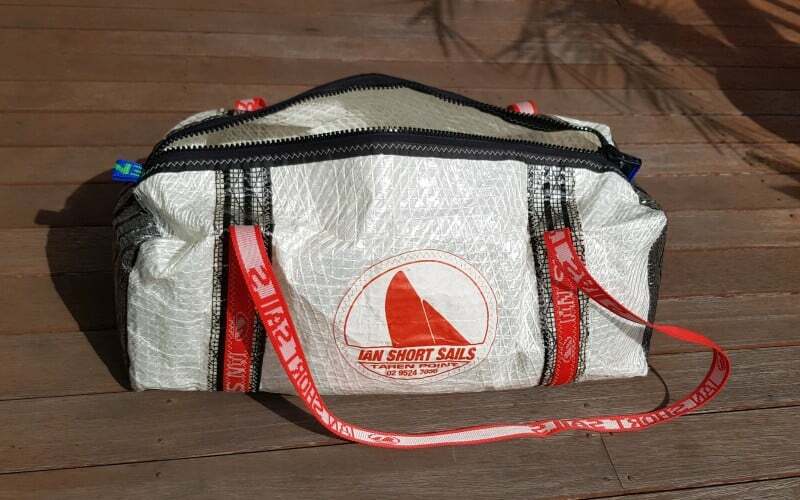 However, if all you plan to protect from the elements are a number of smaller items or even your laptop computer, you’ll find sailing accessory bags and pouches designed to meet your specific needs. Waterproof, lightweight and durable, your electronics or other valuables will be protected and safe. Made with seals, zip pockets and straps, you’ll be able to take your things on your next day out on the water and keep them dry. The blue sky BASICS are ultra light waterproof pouches. They are designed to keep your valuables safe from water and theft. Available in a 2-pack, the pair weigh less than a quarter of a pound but are durable and effective. The pouch includes three zip lock seals to keep your accessories dry and an adjustable strap to keep your essentials secure by your side. When you have your laptop with you sailing, it stands a good chance of getting wet. With the Aqua Quest Storm Laptop Case, you just insert, zip and water won’t get anywhere near it. The case is completely waterproof, lightweight and durable. It is designed with a low profile that is specifically for a laptop. The sleeve is padded so it will hold your laptop securely and the double zip lock seal keeps water out. The welded seams give it strength. The manufacturer has attached a two-year ‘no worries’ warranty to this product. There are many types of sailing bags. They all have the same basic requirements – lightweight, durable construction and waterproof. Some come with a specially designed airtight seal while others have zippers. Each has straps to allow you to carry the bag wherever you need it to be. A few styles will actually float on water should they get knocked overboard. All contain compartments for added security when storing valuables. Often when out on the water it’s a concern that your valuables and gear can get wet. If you share this concern, then you’ll want to invest in a good quality sailing bag to keep your essentials from getting damaged.